If you have a runner in your life and are searching for running gifts you have come to the right place. We have out source our running community of more than 100 000 fans and ask them what are the best gifts for runners? Here are our top 10 results from them. Our gift guide showcase cool running gifts for under $40 that are sure to make the runner in your life jump of joy…perhaps run of joy! LOL. Rests assure you will find something here for the runners that already have everything! No1 - Use a running medal display to show him or her how proud you are of their race achievement. Running is not easy and waking up early on weekend to run a race is something we should be proud off. Running medal holders makes perfect gifts for women and men a like. We offer a huge selection of 400+ inspirational quotes. No2 - What better gift for a runner than the gift or running? Seriously this is the most desirable present for us runner! Have time to run more. Give virtual races with medal packet to the runner in your life to tell him or her that you will always find time for them to run. Runningonthewall.com offer more that 20 unique virtual runs that can be use as gift basket for runners that are filled with running gear. Our virtual races are sure to make any runner more that happy…and surely the buyer too since they are offer at such a discounted price! No3 - Use a smaller size format race bib holder with or without hooks for medal to give to a beginner runner or to an achieved athlete to put in the office. These race bib hangers fits in any area and are just a simple way to give the runner in your life that extra smile when passing in front of all his accumulate race bibs! Click here to see our huge selection offering 20 different colors to choose from. no4 - Our trendy arm warmer are so acclaim by the community of runners that we must put them in the gift guide. Women are simply just crazy about them. So fashionable and perfect for cool weather. Choose from 6 color and 20 different inspirational quotes. They make perfect gifts for female runners. no5 - It is well know that women like jewelry…runners included. A great gift for runners can be a running bracelet, a running necklace or even better a running bracelet with a watch! We offer various design so again have a look here if you feel this would make the running women in your life happy! no6 - Running hat or visor are so important for runner because they protect our faces from the sun. Running on the wall design such a lightweight running hat that everyone that use it is really impress by it. And that is not all these ultimate visors have sweat absorbing brim and can be wash instantly and simply under the sink water. They will also dry so quickly that they can be worn again just a couple hours later fresh and clean! That is surely a cool running gift! no7 - Customize running shirt. You can offer the perfect marathon gift again by choosing from our collection of race theme t-shirt…many women like to run Disney races and love to wear a little something that will fit with that. Or you can customize a shirt for them to wear in the race with their name on so that they can get as many cheers as possible while running… Isn't this AWESOME! no8 - Again running on the wall did it this year with their runners recovery sandals! Runners out there are just crazy about it, everyone LOVE them. Use these sandals after the run in or outside the house to boost your post run recovery. The thick and extra cushioning outsole and the massaging insole will activate blood circulation and help the athlete recover faster. 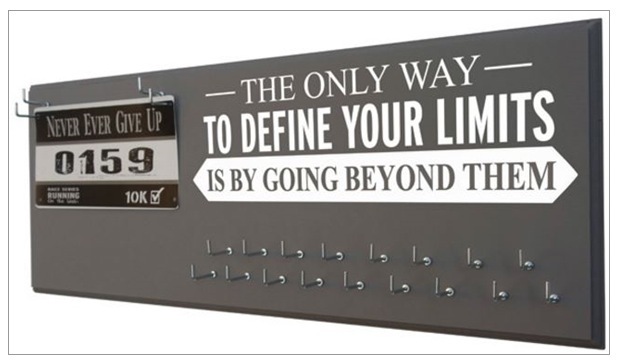 no9 - Use a fun but meaningful bumper sticker or wall decal or computer sticker to show the marathoner in your life how much every little run counts towards their great achievement of maintaining a healthy life style. Choose a race specific distance running sticker or simply a regular RUN one that can be put anywhere!